Offering you a complete choice of products which include burglar alarm system, gsm alarm system, gsm security alarm system, gsm shutter alarm system, intrusion alarm system and security intrusion gsm based alarm system. Microcontroller based total wire free Home Security Alarm System is designed & manufactured by Jyoti Telecom. It will help you to protect your premises from the unwanted entries. It will alert you by the loud audio siren and it will make telephone calls to the user mobile phone with pre-recorded voice message. Its auto dialer works with fixed land line or GSM (SIM) network. · LCD Display with LED indications. · Wireless Door/Shutter sensor with ID no. · System on/off control by using Android Mobile App. · Emergency key switch to On/Off system. · 12vdc operating derived from 230vac. · Idle power consumption is 30mA. · Operating TemperatureRange 0 to 50 °C. · Max. 5 Mobile numbers can be memorized. · Mechanical Dimensions in mm L-300, W-200, H-60. · Weight 600 gm without battery. Wireless GSM Alarm System is designed & manufactured by Jyoti Telecom.It is microcontroller based electronic system. It will help you to protect your premises from the unwanted entries.It will alert youby sending SMS and Call by using GSM SIM card.Because of GSM network no distance limit, one can check system status from any part of the country by using cell phone. You can check status of the systems just by giving a miss call, system replies you its current status. 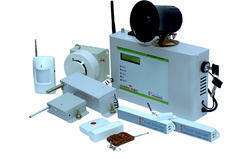 GSM Alarm System contains one active SIM card, GSM module and micro controller. The mobile number of the user can also be registered remotely by SMS programming. Applications: Home, Bank, Industries, Petrol Pump, Jewelry shops, Offices. LCD Display with LED indications. Wireless Door/Shutter sensor with ID no. System control by using Android Mobile App. 12v Siren output and 40 sec. Pre-recorded Voice message. Idle power consumption is 30mA. Operating TemperatureRange 0 to 50 °C. Mechanical Dimensions in mm L-300, W-200, H-60. Weight 600 gm without battery. Alert Type: - SMS, Call Alert with Voice Message, Hooter Alert. · 12vdc operating derived from 230V AC. · Idle power consumption is 30 mA. · Weight 600 gm. without battery. 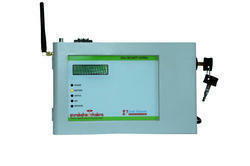 GSM based Wireless Shutter Alarm System is designed & manufactured by Jyoti Telecom. It will help you to protect your Offices, Godowns, etc. From the unwanted entries. It will alert by the loud audio siren and it will make telephone calls to the user mobile phone with pre-recorded voice message if unauthorized person try to open shutter, its auto dialer works on GSM Network. · Wireless Shutter sensor with ID no. 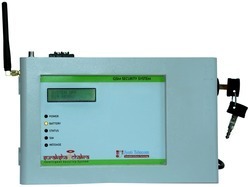 Microcontroller based Intrusion Alarm System is designed & manufactured by Jyoti Telecom. It will help you to protect your premises from the unwanted entries. It will alert you by the loud audio siren and it will make telephone calls to the user mobile phone with a detailed voice message. Its auto dialer works with GSM (SIM) network. System Control by Android Mobile App. SMS, Call Alert with Voice Message, Hooter Alert. Microcontroller based Intrusion Alarm System is designed & manufactured by Jyoti Telecom. It will help you to protect your premises from the unwanted entries. It will alert you by the loud audio siren and it will make telephone calls to the user mobile phone with detailed voice message. Its auto dialer works with GSM (SIM) network. 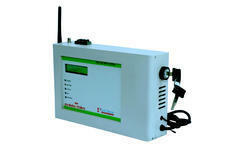 GSM based Intrusion Alarm System contains one active SIM card, GSM module and micro controller. The mobile number of the user can also be registered remotely by SMS programming. · 5 Nos Telephone auto dialer. · System Control by Android Mobile App. · 48 Hrs. Inbuilt Battery Backup. · Alert Type: - SMS, Call Alert with Voice Message, Hooter Alert. Wireless Security System is designed & manufactured by Jyoti Telecom. It is the microcontroller based electronic system. It will help you to protect your premises from the unwanted entries. It will alert you by sending SMS and Call by using GSM SIM card. Because of GSM network no distance limit, one can check system status from any part of the country by using a cell phone. You can check the status of the systems just by giving a missed call, the system replies you its current status. Home, Bank, Industries, Petrol Pump, Jewelry shops, Offices. Wireless GSM Security Alarm is designed & manufactured by Jyoti Telecom. It is a Microcontroller based wire free electronic system. It will help you to protect your premises from the unwanted entries. It will alert you by sending SMS, Call on user mobile nos.and also alert by the loud audio siren. Its auto dialer works with a fixed landline or GSM (SIM) network. Secure Your Homes, Offices 24x7. GSM & Landline Auto Dialler Alert on 5 Mobile nos. Loud Siren and 48 Hrs Battery Backup. User-friendly and Easy to Install. Home. Office, Shops, Industry, Jewelry Shops. Wireless Security Alarm system for Homes is designed & manufactured by Jyoti Telecom. It is Microcontroller based wire free electronic system. It will help you to protect your premises from the unwanted entries. It will alert you by sending SMS, Call on user mobile nos.and also alert by loud audio siren. Its auto dialer works with fixed land line or GSM (SIM) network. • Wireless Anti-Theft Home Security Alarm System. • Secure Your Homes, Offices 24x7. • GSM & Landline Auto Dialler Alert on 5 Mobile nos. • Loud Siren and 48 Hrs Battery Backup. • Wireless Door/Shutter Sensor with ID No. • System Control by Android Mobile App. • LCD Display with LED indications. • User friendly and Easy to Install. • Home. Office, Shops, Industry, Jewelry Shops. We provide Security System App to our customer. With multiple versions of the Security System App and a huge number of screen resolutions to cater for, kryon pride ourselves in quality android and ios app development.